Today’s post is the latest in a series of political cartoons from historian and illustrator Mark Wahlgren Summers, author of The Ordeal of the Reunion: A New History of Reconstruction. On Thursdays, we feature a new cartoon—hand drawn by Summers—that offers a creative, satirical spin on Reconstruction history. Each cartoon is accompanied by brief commentary from the author/illustrator to help put things into context. 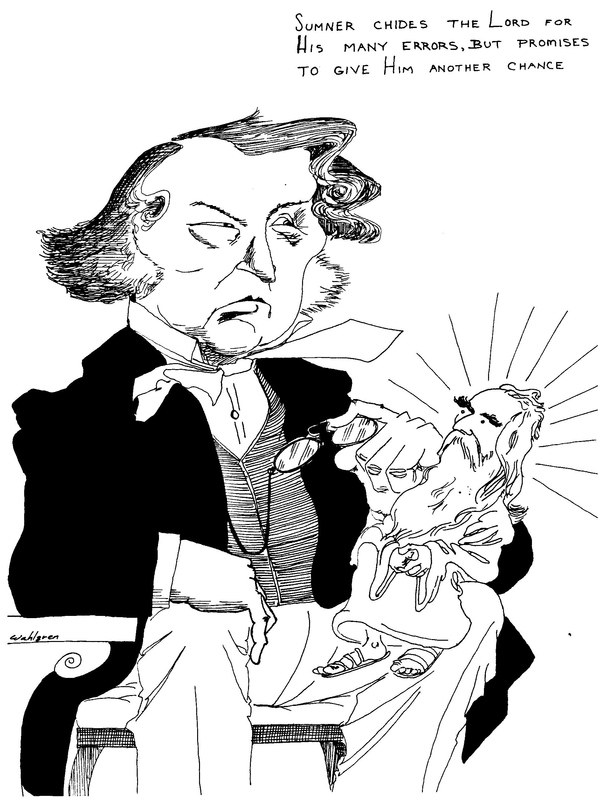 “Sumner chides the Lord for His many errors, but promises to give Him another chance.” Dealing with Senator Charles Sumner of Massachusetts must have made many of his colleagues appreciate why so many martyrs were burned at the stake. Sumner was righteous, eloquent, learned, and on the great questions of human equality he was conscience itself. But how exasperating it was for more practical senators to be lectured on where and how they were wrong by this dogged, pompous, thin-skinned, humorless man—and by “one of them d—d literary fellows,” as a Michigan politician grumbled! Grant was asked whether he had ever heard Sumner converse. “No,” the president answered, “but I have heard him lecture.” At another point, it is said, someone told him that Sumner did not believe in the Bible. Not surprising, Grant responded: “he didn’t write it.” In a tawdry age, Sumner’s integrity and courage made him stand out. They also helped make him an outcast. When he fought the president’s scheme to annex Santo Domingo, Grant used his influence to depose Sumner as head of the Foreign Relations Committee.